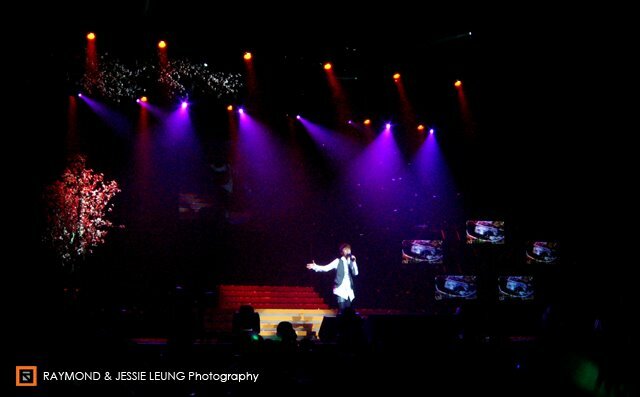 Jessie and I seldom go to Chinese concerts after we started to have a busy photography life. This time, Alex (my buddy + long-term client) gave us 2 tickets of a Chinese concert. 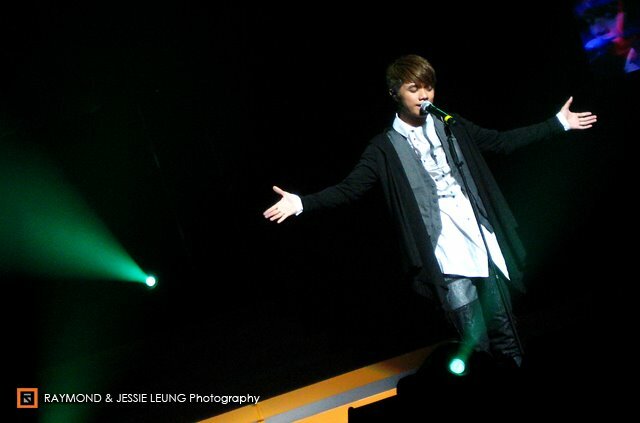 We like the singer (Hins Cheung) and his songs. Thanks again, Alex. When you read up to this point, you may think this post is not really business/photo related. Actually... it is related. Please read. Alex's tickets cost Cad$168 each. We were at Row-K and seats were great. 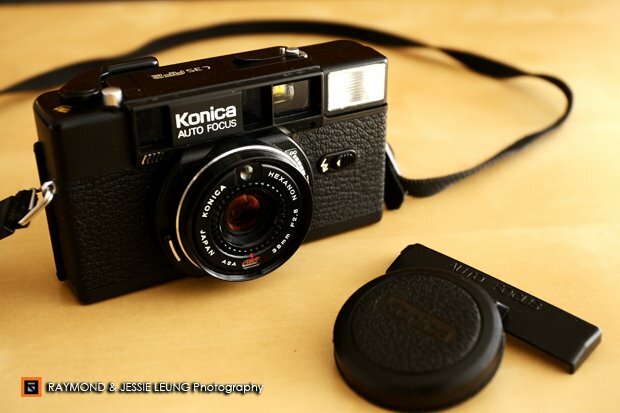 Therefore, we only brought our toy cam, Canon A570 IS. From work experience, I expected to have a strong spotlight which will bring the shutter to 1/100 f/5.6 @ ISO400. So, tiny camera with M-mode should be more than enough. Photos came out ok at the end (see below). 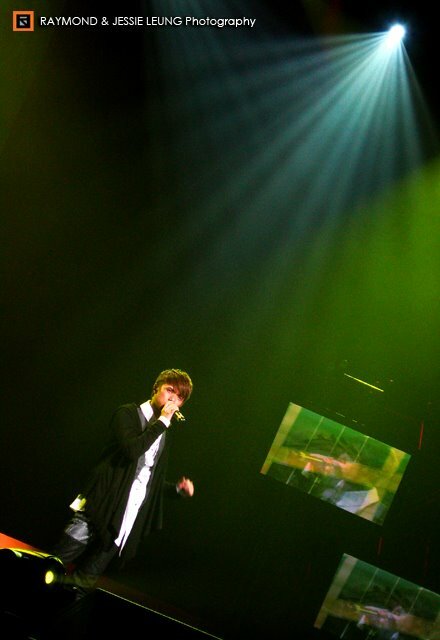 The show started with a video showing a conversation between Hins and an unknown female singer. The video was shot with a standard definition DV without locking exposure. Because of back lighting, we could only see them in shadows. At that time, my mind popped up "OMG". How can the videographer unnoticed about the back lighting? So unprofessional!!! When I was still wondering what was happening, a female singer came out to sing for 15 mins. She was ok... but she wasn't really suitable to sing "Loving You". Horrible. Hins came out... wait wait a minute! What was that lady's name? LOL... no one mentioned her. I found out two tripod-mounted Canon GL2 DVs were set in front of the stage and they were very annoying. The usual way was setting main video at the level of performers from a distance and zoomed in. For those at the front should be moving with roller tripods or with Steadicam. I was a bit shocked about this unprofessional setting. There were two official photographers. They walked/ran in front of $168 area. I knew people were really angry for being blocked by the photographers in their expensive show. (I might do the same when I was new). The sound system was horrible. Music volume was way louder than vocal volume. Dancers were my "OMG #2". I was shocked! Their basic skill was worse than beginners. Their arms had no strength, jumps had no height, and kicks couldn't be defined as kicks. They danced with their own paces and own beats like rave party. What a jaw dropping performance! The best part was security guards. They should have kept an eye on the performer. But their super-slow reaction gave the fans an "all-you-can-go-to-stage" opportunity. Fans went on to the stage to hug and photograph with Hins all the time. When the security guards noticed that, fans were getting down the stage already. I guess it happened for at least 4 times. When Hins shook hands with fans, security guards didn't stand beside him. Why? It was because they forgot that they were actually working rather than enjoying the show! Hins would be stabbed for 10 times before the guards' notices. The best of the best was that the concert ended after one hour (approximately 10 songs) including the unknown female singer's part. OMG.... $168 for 60 mins??? I read facebook about the lucky draw matter. The winner didn't get the prize. It should be a laptop. At the same time, Alex's "Toy Watch" lucky draw was canceled. The biggest victims should be the sponsors. Enough for the ultimate experience. When I started this photo business, I told myself and Jessie... "I am going to give 120% efforts for every penny from clients". We are doing it professionally because we respect our clients and our job. Business will not last long if you treat clients and consumers like fools. The first commercial shooting in 2009 was a 1.5 hours task from my buddy, Alex. 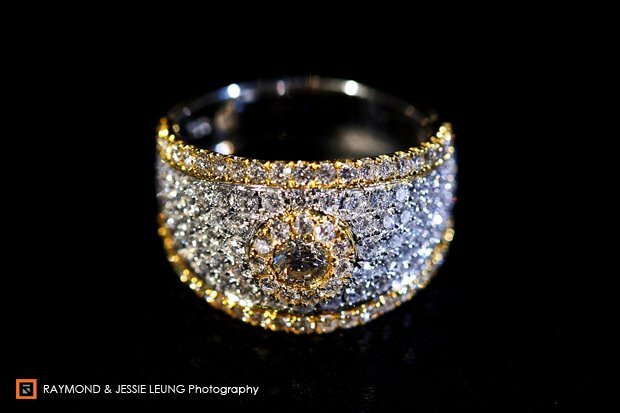 I have been working with his store, Christine Jewellers (www.christinejewellers.com), for about 2 years. I started with his posters and signs layout designs. Now, I'm slowly moving to photography works for his products and advertisement. I feel sorry about missing schedule on his design tasks when Jessie and I are getting busier and busier with wedding shootings. I can't say I'm sick of InDesign but I don't feel bad in front of PhotoShop. I started using PhotoShop seriously at its 4.0 version and I learnt a lot of advance stuff when I worked in newspaper. PhotoShop is living in my blood. 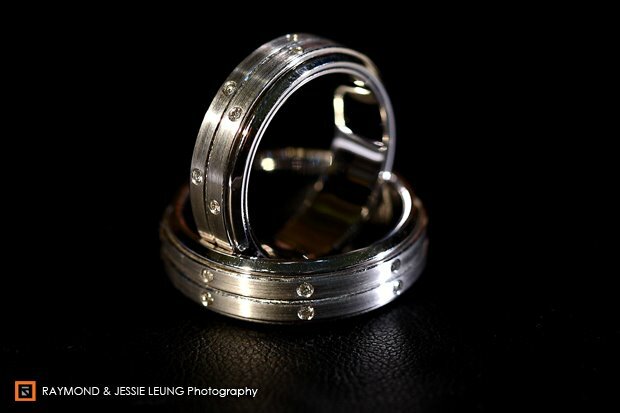 Moreover, we do wedding photos production everyday. Photo shoot + production are easier and faster than working in front of Illustrator and InDesign. This shooting was done during my food poisoning period. As usual, I shot in his store front because his items are expensive stuffs. I tried to match what I previously did for Alex. However, I wanted to be a bit different. So, 2 slightly different temperature light sources on 2 sides were used. I couldn't believe that I finished numerous items in 2 hours (before 8pm) without softboxes and other proper setup. If Japan or Hong Kong Edition Seiko watches and other cool stuff are your cup of tea, you should go to Christine Jewellers to take a look. It has a wide range of selections with the latest and fashionable styles. 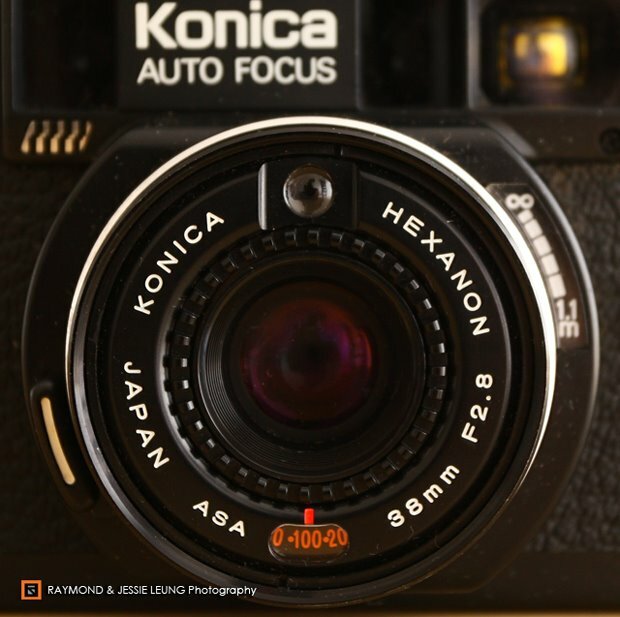 I used the Konica in high school period. I have no idea why I just hated shooting group photos in camping events as all friends did. All of them wanted to see my photos and talked about the trip afterward. However, they didn't think my photos are "real photos" because I didn't have group photos. I called those photos as real memory and they were different from all set-up shots. Now, I know it is called "Photojournalism". My real life of photography started to grow. P.S. If grandfather were still here, he might want to see our work cameras. It would be my turn to give him my old Canon G5. Miss you so much, grandpa. Time goes fast. 2008 was a "Year of Change" for us. We joined WPPI and got accepted by WPJA. Brian joined us and we are a team of 3 people now. I spent more time on photography than design works in 2008. It gave me more time to plan our new direction (on photo-art and business). 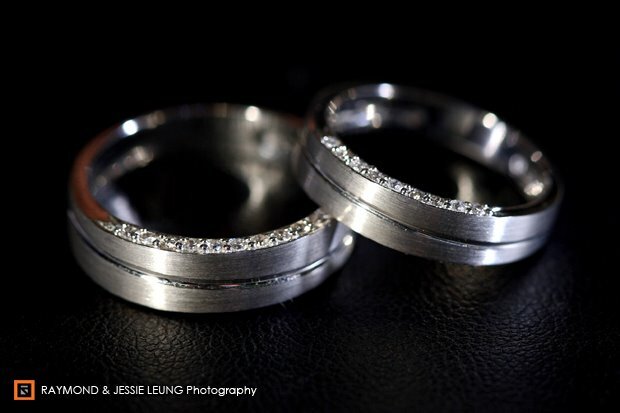 Looking back, I had started being a wedding photographer by working alone and setting up a studio called X-Ray Studio. Then, I had worked with an Indian wedding photo/video team for quite a while. The learning process was long because I didn't know much about Indian culture before. 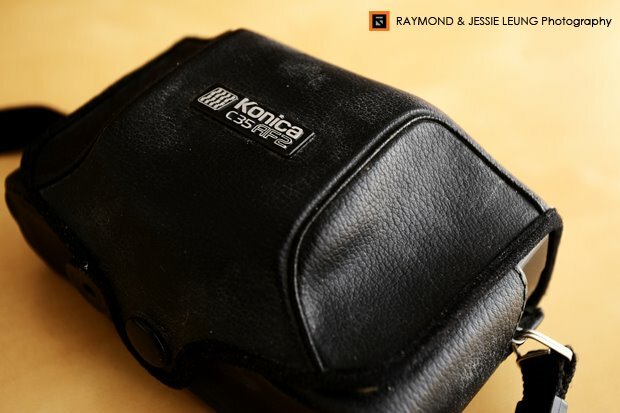 In 2008, I made a right move to team up with my wife Jessie and changed the studio name to Raymond & Jessie Leung Photography (RJP). Jessie is a talented photographer and the most reliable partner. After working with her, my whole photography world has changed into a rocket ride. During 2008, we have developed our own style and got recognized by WPJA - one of the leading associations for wedding photographers in the world. 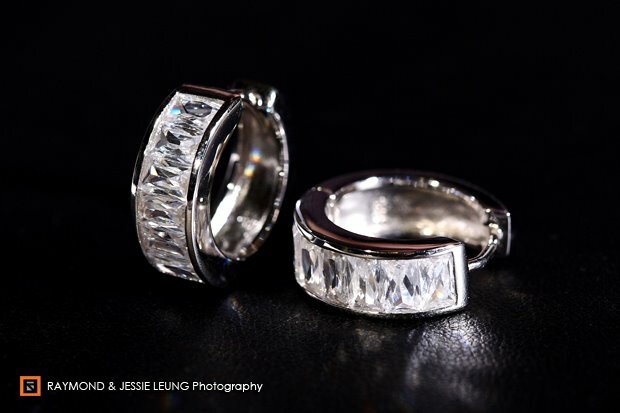 For 2009, Jessie and I can't wait to attend WPPI's convention at Las Vegas in the coming February. Next wedding season is coming and we are excited to work with new clients. From time to time, we will keep exploring new ideas in each wedding we document. 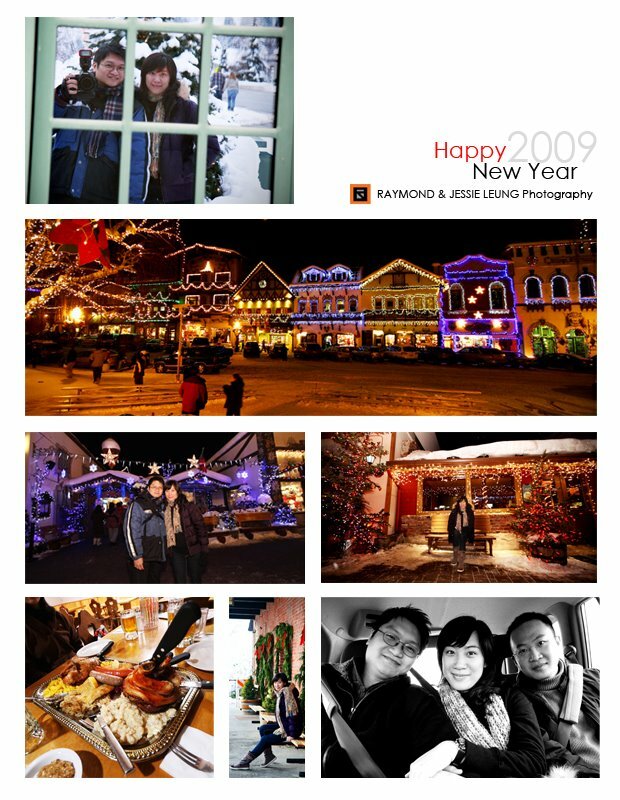 At the end of 2008, RJP team went to Leavenworth , WA (after our last snowy wedding job in 2008). We had a great time over there (ate roasted pork leg). Below are the highlight of the trip.